June Johnson, age 99, of Aurora, passed away Sunday, January 1, 2017, at Memorial Community Care. Funeral Services will be held 11:00 A.M., Thursday, January 5th at the Chapel of Higby-McQuiston Mortuary in Aurora. Rev. Ron Harris will officiate. Interment will be in the Aurora Cemetery. Visitation will be one hour prior to the service on Thursday. Memorials may be made to the Aurora United Methodist Church. Condolences may be e-mailed to the family through the mortuary website at www.higbymortuary.com. 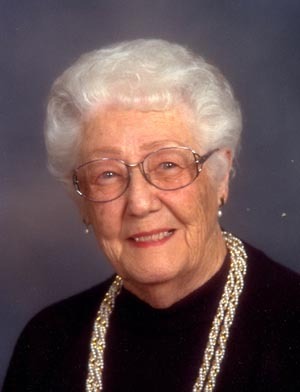 June Marie Johnson, the daughter of Ralph and Myrtle (Dean) Spry, was born in Beaver Crossing, Nebraska on September 9, 1917 and passed away in Aurora, Nebraska on January 1, 2017, at the age of 99. She grew up in Columbus and at age 10 her family moved to Aurora. June graduated from Aurora High School and attended business college in Lincoln. On September 27, 1953, she was united in marriage to Reuben Albert Johnson at Aurora, Nebraska. June worked as a secretary with Reuben at the Reuben Johnson Insurance Agency. They retired from the insurance in 1974, and sold their interest in the agency to Bob Leach and Bob Clark. Reuben passed away on October 13, 1994. June was a member of the Aurora United Methodist Church, where she was very active over the years, and the Aurora Chapter of the Order of Eastern Star #93. They enjoyed traveling, whether camping in their motor home or sightseeing in Europe. They spent many years in Arizona, where they played a lot of golf. She enjoyed gardening, especially roses. She loved spending time and taking trips with her granddaughter. She was preceded in death by her parents; husband, son, Steve Norris and son-in-law, Gene Bryant. Those who remain to cherish her memory are her daughter Karen Bryant of Waterloo; granddaughter, Athena Montauge; 3 great-grandchildren, Ahlia Montague, Kaitlyn Nielsen and Andrew Nielsen and great-great grandson, Alijah Montague.